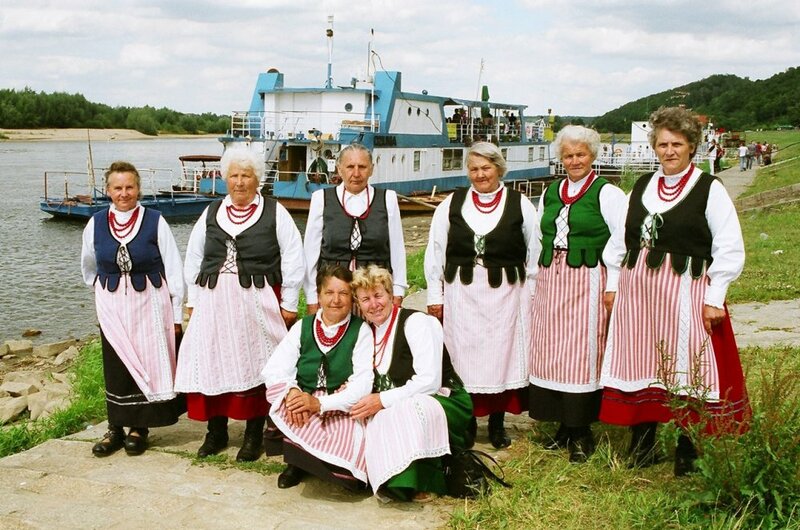 The Istebna Regional Group, which derives its name from its hometown, is one of the oldest folk bands in Poland. Istebna is a village and municipality located in the Silesian Beskids, on the current border of three countries: Poland, the CzechRepublic, and Slovakia, an area inhabited by the Silesian Gorals. The group has a rich and exciting history. Its first performance took place in 1901. The Gorals from Istebna, Jaworzynka, and Koniaków performed at the Przysłop glade under Barania (Ram) mountain at a hunting lodge belonging to the Hapsburg dynasty – a place where Archduke Friedrich used to come to hunt. The Emperor was so taken with the naturalness and spontaneity of their vocal and instrumental performance that he invited the Gorals to Vienna. A few years later, in 1908, the artists from Istebna presented a Goral wedding performance on the 60th anniversary of Emperor Franz Joseph’s coronation. In the 1920s, the group showed the wedding performance on several different occasions, in Wisła, Cieszyn, Jablunkov (present-day Czech Republic), and Chorzów. In 1933, Istebna took part in the Presidential Harvest Festival (dozhinki) in Spała. The year after, it participated in the Song Festival in Wisła, and in the following years at the Mountain Festival in Zakopane (1935), Mountain Jamboree in Sanok (1936), and in the Mountain Festival (Mountain Week) in Wisła (1937). The group’s activity was halted by the Second World War. The group also went through a hard time after the liberation of Poland. It managed to reassemble, but encountered a number of obstacles (lack of costumes, funds and venues) and almost entirely suspended its rehearsals and shows. In 1961, it was decided to revive the group. Zuzanna Gembołyś was made its manager, while Anna Urbaczka became her deputy. The group had its weekly rehearsals at a local school, and later at the hall of the local forestry inspectorate, which for a while acted as Istebna’s patron. The group received a lot of help from the Istebna Municipal Cooperative. In the 1960s the band took part in many events and festivals: in Żywiec, Szczyrk, Ustroń, Cieszyn, Zabrze, Katowice, Warsaw, Kielce, Poznań, Zakopane, and Bukowina Tatrzańska. 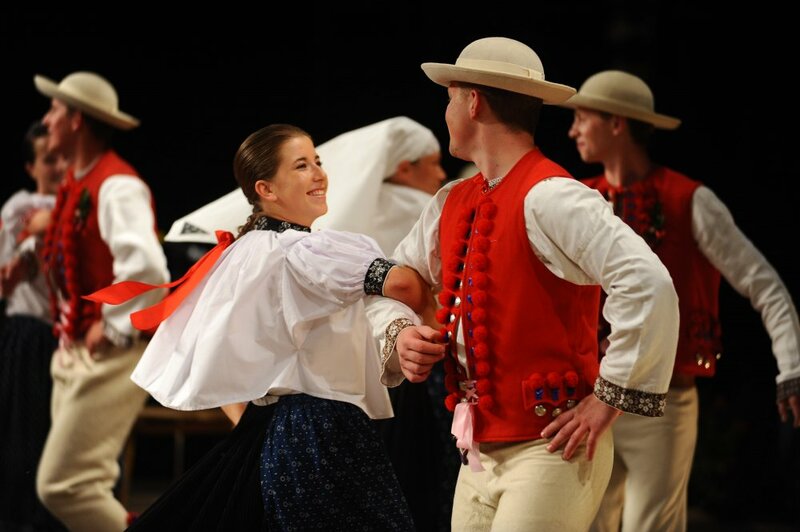 It also performed in Czechoslovakia, at the Mountain Festival in Jablunkov, and the Strážnice International Folklore Festival. It received many awards and distinctions, and was frequently featured on TV and radio. In 1967, the managing position was taken over by Anna Urbaczka-Bury. Zuzanna Gembołyś was still involved with the band, as the leader of the youth group Młoda Góra (The Young Mountain). In September 1969, the band was invited to the set of the TV series Czterej pancerni i pies (Four Tank-Men and a Dog). The scenes of the weddings of two of the show’s couples: Janek and Marusia, and Gustlik and Honoratka, were filmed in Istebna Municipality – the group enacted a Goral wedding for these scenes. Before that, the group also performed in Słońce wschodzi raz na dzień (The Sun Rises Once a Day), filmed in Koniaków. A lot of the band members are local poets, prose writers and storytellers associated with the Literary Club in Istebna. In the early 1980s, some of the members transferred to another group founded by the educator Józef Broda in Istebna-Zaolzie. At the time, Istebna was led by Anna Urbaczka-Bury, who gathered such prominent soloists as Jadwiga Zabawska and Stanisława Majeranowska. After a break of a few years, the group was revived by Józef Kawulok, who invited several young dancers, singers, and musicians to take part: Piotr Kukuczka, Adam Sobol, and Kazimierz Urbaś. The new band and dancers would often attend concerts in Austria, CzechRepublic, Slovakia, etc. In 1993, Elżbieta Legierska from the Istebna Municipal Culture Centre became the manager of the group. The group was revived once again on the occasion of its performance at the National Philharmonic in Warsaw, which formed part of the Song of the Fatherland series. The band collaborated with the Mazowsze group and presented the folklore of the Silesian Gorals. They were supported by the ethnographer and cultural researcher Małgorzata Kiereś. Its next manager after Legierska was Michał Zowada, who invited his siblings, cousins, and acquaintances to join the group. Katarzyna Juroszek prepared choreography for Istebna, based on traditional forms. The group had an accompanying music ensemble led by Damian Legierski. Istebna began to travel to various international festivals in England, Scotland, France, Romania, CzechRepublic, and Slovakia. 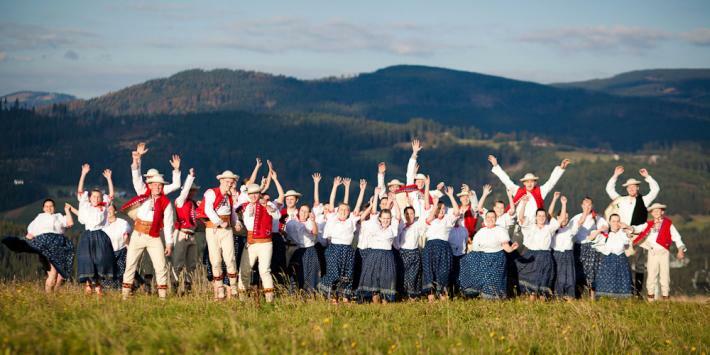 The group received awards at national competitions, and honourable mentions at the Festival of the Polish Gorals’ Folklore in Żywiec, International Folk Meetings in Wisła, International Festival of Mountain Folklore in Zakopane and International Folk Meetings (with a competition for the Łowicz Pasiak) in Łowicz. Since 2002, the group has been a member of the International Board of Folk Associations, Festivals, and Arts (CIOFF). Goral music, songs and dance are our passion. We wear our costumes with pride. We don’t dress up in them, but simply wear them. Just like our parents, grandparents, and great-grandparents. Everything in this band is authentic. Everything comes from the heart. It has been like that for generations. For over 100 years now.